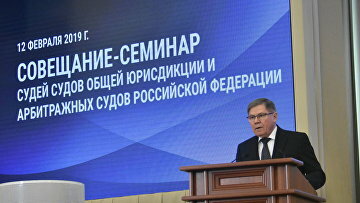 Russian Supreme Court Chairman concedes jury competence expansion | Russian Legal Information Agency (RAPSI). MOSCOW, February 12 (RAPSI) – Chairman of the Russian Supreme Court Vyacheslav Lebedev has admitted the possibility of the further competence expansion of jurors. Lebedev is seeing way clear to increase the list of crimes which could be considered by jury. Perhaps, time will come when jurors will be authorized to hear civil cases too, he told journalists on Tuesday. On February 12, the Supreme Court delivers a workshop for chairs of courts via videoconferencing. The meeting is dedicated to the finalizing of courts’ work results in 2018 and further priority task definition. 15:24 12/02/2019 Chairman of the Russian Supreme Court Vyacheslav Lebedev has admitted the possibility of the further competence expansion of jurors.